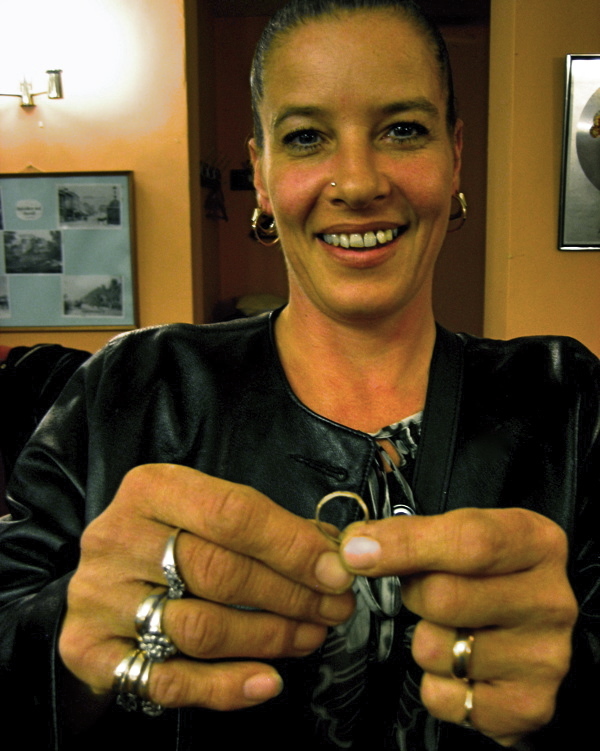 This is mudlark Rae, proudly displaying the gold ring from 1668 that she found in the Thames at Southwark. “It was a total piece of luck,” she admitted modestly, “the first ring I ever found. 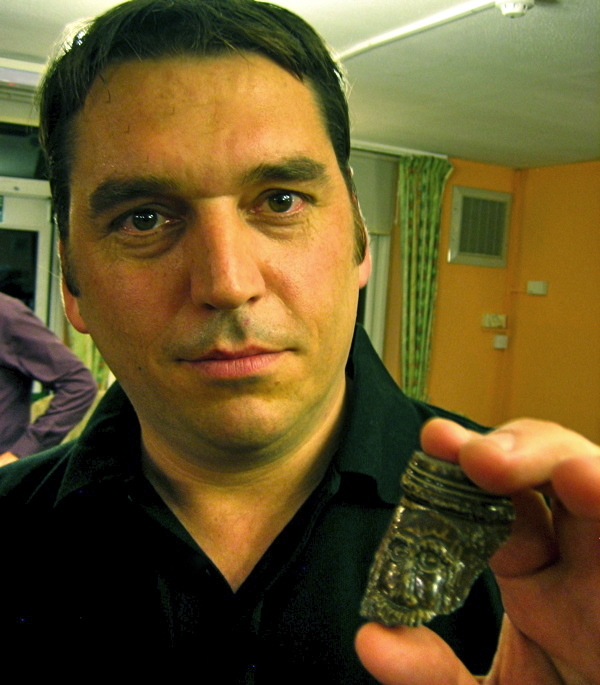 I had a little gander and there it was sitting on top of the mud.” The pleasingly irregular ring is delicately engraved with the name “Alex Cheenke” and the date “15th February 1668″ on the inside, and has a curious design of a skull on the outside, extended like the skull in Holbein’s “The Ambassadors” in the National Gallery. Rae explained it is an obituary ring – there was a custom for people to leave money to pay for others to wear rings in remembrance of them. The ring has special significance for Rae, because it is dated the day after Valentine’s Day and her daughter’s fiance, also named Alex, died on the day before Valentine Day, 13th February. And thus it was that a ring lost over three centuries ago in the Thames acquired a vivid new emotional meaning in the present day, connecting directly to its original purpose as a token of remembrance and bringing Rae into a personal relationship with the long distant Alex Cheenke. Rae brought the ring along to the monthly gathering of the members of Thames & Field, the community of mudlarks presided over by Steve Brooker, where she was handing it to Kate Sumnal, the Finds Liaison Officer from the Museum of London, so that it could be studied and the location of its discovery plotted, adding to the greater picture of Thames archaeology. When I arrived at the meeting after walking through the dark suburbs of Bexleyheath, I felt I had arrived at the court of the Mud God, because as I came in from the rainy street into the harsh lights, I encountered Steve regaling an circle of attentive neophyte mudlarks with eloquent and impassioned tales of his spectacular finds in the Thames. It was an uninspiring lounge with an institutional atmosphere attached to the public library, but that was irrelevant to the mudlarks because they had all brought inspiration with them in tupperware boxes and plastic bags, containing recent discoveries to show. They were a diverse crowd of different ages and social backgrounds, of which the only common factors were that none of them was afraid of getting their hands dirty and they all shared a fascination with liquid history. The enigma of the evening was Woolwich John, a white-haired softly-spoken Irishman who drew a crowd of envious admirers for the Tudor dagger handle he had to show. “What some of these people have in a year, he can find in a week,” Steve Brooker whispered in my ear, out of reverence for John, the old fox standing nearby who has searched the beach at Woolwich every day for the last twenty-six years. “Just fit for lady,” announced John, a legend amongst mudlarks, as he passed me his elegant black dagger handle with ruffled head finial, raising his sprightly white eyebrows and peering at me in quiet satisfaction. “It’s artifacts, it’s history,” he said, to articulate my thoughts, as I turned the piece over in silent wonder. While I could not resist the infectious delight the mudlarks took in their finds, equally I shall never forget mudlark Mike’s description of the “splatted musket ball with a human tooth stuck in it” that he found in the river at Greenwich. Lined up at a bus stop, you would never guess they were all kindred spirits, mudlarks unable to resist the call of the Thames offering up its secrets at low tide. Yet they share a mutual respect that cuts across everything else. And in each case, the connections they have discovered with other worlds and other times – all within London – serve to liberate them from the present moment and grant a fresh vision of the infinite possibility of life. Mudlark Euan with the fossilised tree bark he found in the river in Southwark. Mudlark Peter with a fragment of a Bellemine jug from a Tudor dump in Greenwich. 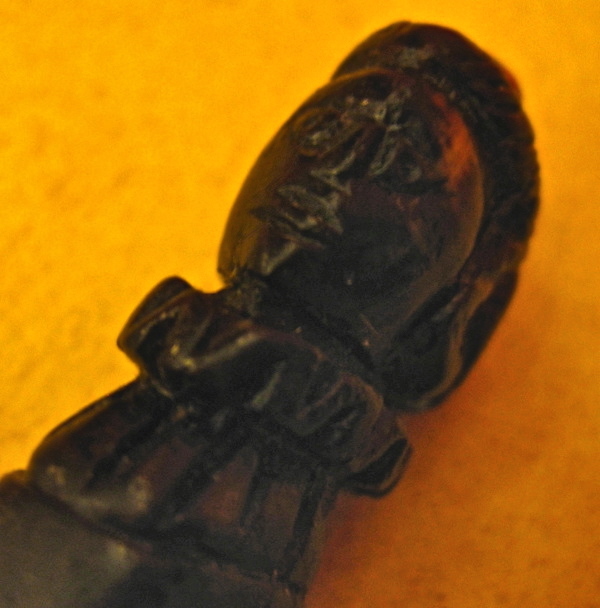 The handle of a Tudor dagger found by Woolwich John at Rotherhithe. Once more the gentle author puts “MOOD, FEEL, LOVE AND LIFE” into what we do on the thames………i love his words !!! 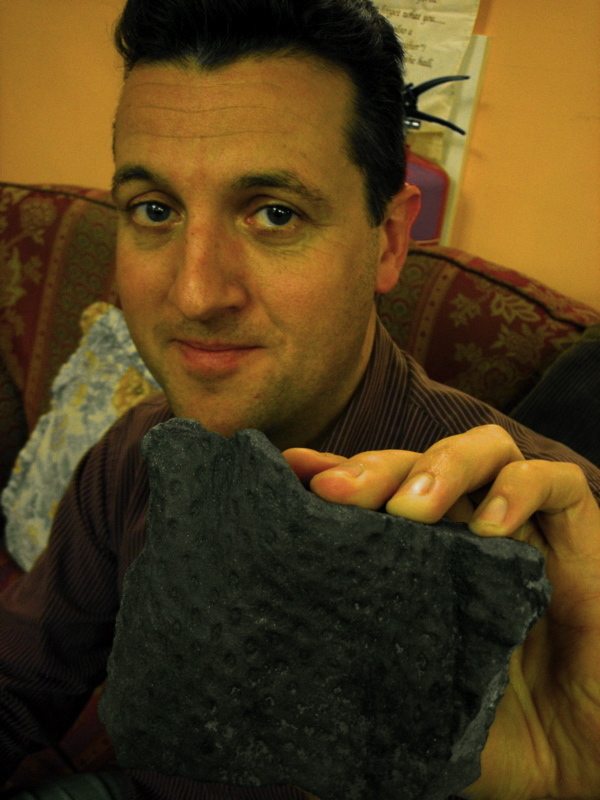 As for the picture of euan and his fossilised tree bark, i think that will go straight onto his mums mantel-piece…………….and rae’s picture, straight onto the CRIME WATCH gallery of rogues !!! Thanks GENTLE AUTHOR for taking us under your wing of words again…………MUD GOD. Once again, I wish I could be there. Sigh. I am part of this fine group and I am privileged to be so, where else can you see such amazing things up close and indeed be the finder of some of them. Long may the Thames continue giving up the goodies for us all to see and touch. Fascinated by the Smithsonian article on Mudlarks. Love the Thames, love London, and am avid for any tidbits of history. Museums and art be damned! Now all I want to do is dig in the mud.